ACTION ALERT: Make It Mandatory to Have ALL Pets Spayed,or Neutered in Every State! - PLEASE SIGN ! Noted and signed, Thank you Simone. I cannot sign and noted, thank you! Noted and sent the letters. This is so important. 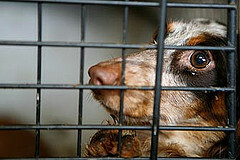 The only way to prevent animals suffering in awful shelter conditions is to reduce the number of animals born. Please!!!! Do it! Thank you for posting. Signed with revisions. Noted but I am unable to sign as the site accept only US addresses.